Driving the all-new 2015 GMC Yukon in the Yukon. Even the invitation from General Motors suggested it was a bit cliché. 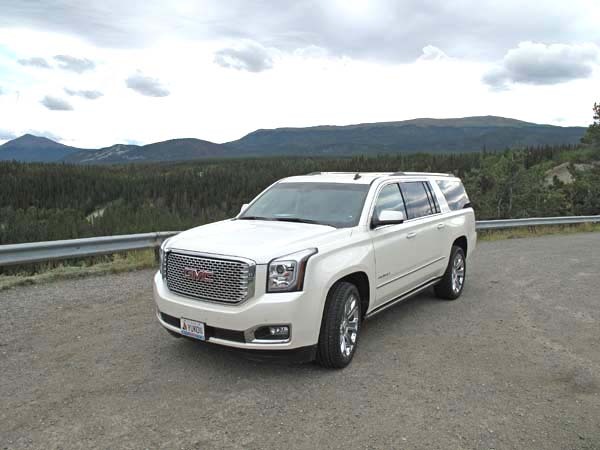 Having never been to the Yukon before it seemed like a most opportune occasion to experience one of GM’s premium utility vehicles in what has been billed as a harsh environment. 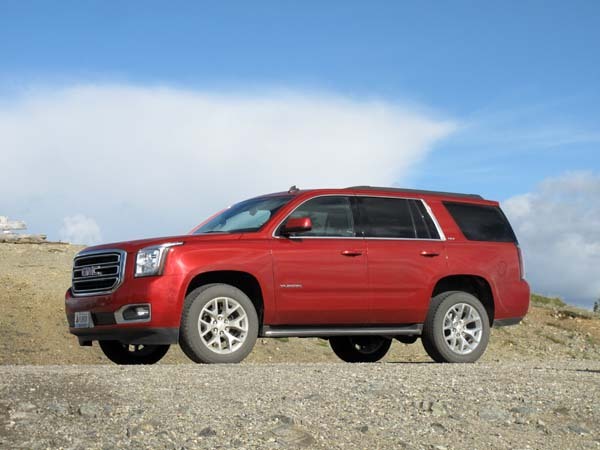 The 2015 GMC Yukon represents the introduction of the fourth-generation of this full-sized SUV. The redesign of the Yukon started with a new frame, made stronger and lighter with the use of high-strength steel. The increased rigidity reduces interior noise and improves handling. The mass reduction helps to reduce fuel economy. The latest GMC Yukon shares its underpinnings with GM’s other full-sized SUV’s — namely the Escalade, Suburban and Tahoe. 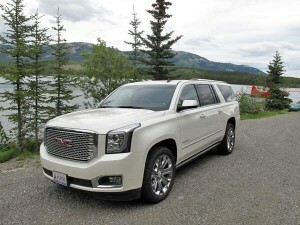 The Yukon has been packaged to appeal to a different buyer, one who likely values the GMC top-of-the-line Denali rather than the more conspicuous Escalade or utilitarian Chevrolet versions. So far, 60% of Yukon sales have been for the range topping Denali model. GM expects that number to fall back to about 35% when the initial demand is satisfied. The bulk of sales are expected to be the mid-range SLT model. A series of Ecotec 3 engines include a 5.3L V8 standard across the line and a 460 horsepower, 406 pound-feet 6.2L V8 engine exclusive to the Denali. At present both engines are paired to a six-speed automatic transmission. An eight-speed transmission is scheduled to be available later this year. Fuel economy is improved in the new powerplants. Variable cylinder management is standard on both engines. The reduction from eight combusting cylinders to four allows the vehicle to consume less fuel when extra power is not required. The 5.3 litre two-wheel-drive model is rated by GM for 10.1 L/100km hwy. A 10% improvement over earlier designs. Although the Yukon’s exterior dimensions remain the same as the previous generation, designers worked within the cabin to maximize space and storage. Luxury was omnipresent with soft touch materials covering the dash and instrument binnacle, while the steering wheel has been laminated with genuine aluminum cladding. On Denali models real wood inlays replace the vinyl panels found on earlier models. Cabin noise has been reduced in both active and passive ways. An electronic noise cancellation system is utilized on the Denali models. Triple seals around the doors are recessed into the frame as well as laminated windshield and front door glass further reduce the in-cabin noise. Unwanted noise has been replaced by the Bose audio system with available Blue-ray DVD video system. A pair of available LCD screens fold out off the Yukon’s roof to entertain passengers in the second and third rows. Bluetooth headsets connected to the entertainment system, which allows the front passengers to listen to their audio choice. The 2015 GMC Yukon will be available in either standard wheelbase or an XL extended version. Both will offer three rows of seating. The third row seat backs fold flat for increased utility when needed. Getting in and out of the XL models was quite easy despite my six-foot frame. It should be noted that seating in the standard model is substantially less welcoming than the XL model. The absence of a sunken foot well on the standard model means your feet are almost at the same level as the seat. In truth, with available nine-passenger seating, the XL competes with mid-sized vans in dealer showrooms. Seating in the front and second rows is as good as you will find in the class. GM engineers have installed dual density foam. The softer material allows you to sink in only so far before the more dense padding holds you in place. 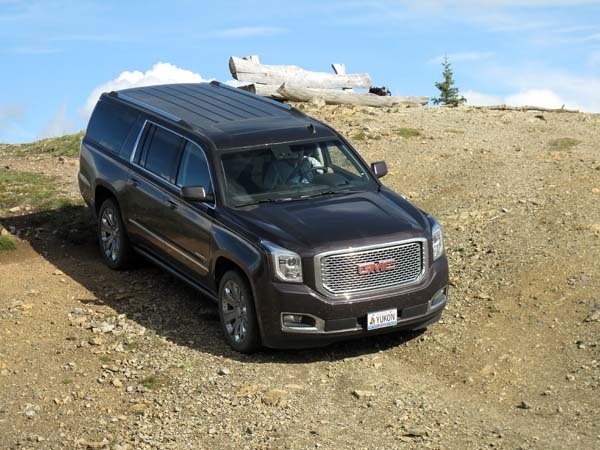 The Denali models we drove were fitted with a driver system that caused pulsing on the side of the seat cushion corresponding to the hazard being encountered. The warning system alerted drivers if you had crossed a solid traffic line or were approaching a solid hazard. Ergonomically the Yukon controls are effectively simple and easy to use. Despite the raft of technology installed in the vehicle. Steering wheel controls cover utility of the LCD driver display centre that replaces a traditional instrument cluster, as well as basic adjustments for the audio system. Thankfully, the primary audio and heating/cooling controls remain adjustable by large rotary knobs in the centre of the dash. An upcoming option for the Yukon will be a 4G LTE Wi-Fi hotspot service provided by GM’s OnStar. While the service contract is with OnStar the signal will be provided by whichever network is a roaming partner in the subscribers’ local area. Details on roaming while travelling or pricing were not available, however, buyers will be treated to a three-month trial. Perhaps the most impressive feature on the new Yukon is the suspension refinement. Of particular note is the Magnetic Ride III system available as a standard feature on the Denali model. The system controls the vertical movement of the ride dampers at each wheel. On roads with potholes and broken surfaces the Magnetic Ride system sensed the drop offs and limited the wheel travel in effect causing the affected tire to float over the cavity. The system is so effective you really don’t notice it until you drive the same road in a vehicle not fitted with the system. A Yukon SLT was available for testing and its system of variable springs at each wheel gave a very satisfying ride over just about every surface. On gravel roads with washboard ridges the base Yukon displayed the typical behaviour you would encounter on any SUV. The rear end of the vehicle lost contact with the road surface and started dancing about. The Denali with the ride control system left you wondering if you were travelling on the same road. It all but eliminated the harshness under wheel, improving stability. With the enhanced ride control the Yukon, especially the XL model, drove like a smaller vehicle than I expected given its full-bodied size. You are only reminded of the vehicle size when looking over your shoulder and seeing the expanse of leather and carpet behind you. Thank goodness for the rear-parking camera! 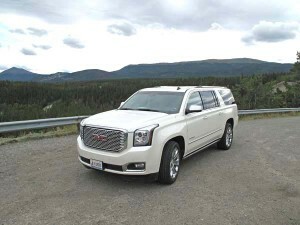 Overall, the 2015 GMC Yukon plays firmly into the brands strategy to offer buyers a different take on a full-sized SUV. Even within the GM corporate stable the GMC brand sits as the Buick of utility vehicles. Not meant for service like a Chevrolet Tahoe or Suburban, it is a refined luxury vehicle that bypasses the conspicuous nature of the Escalade. The 2015 GMC Yukon will start at $51,090 for a two-wheel-drive SLE; $54.390 for the four-wheel-drive version. The range-topping Denali starts at $73,540 ranging up to the XL, which adds about $3000 to the that price.